Held, L., Herrmann, A. M., & van Mossel, A. (2018). Team formation processes in new ventures. Estrin, S., Gozman, D., & Khavul, S. (2018). The evolution and adoption of equity crowdfunding: entrepreneur and investor entry into a new market. We argued that institutional changes in a liberalizing direction are a sine qua non for econo­mies of the European Union to become more entrepreneurial in order to promote innova­tion and economic growth. However, this does not mean that one-size-fits-all policy reforms towards freer markets are likely to be successful. An important reason is that the 28 union member states have very different histories, and distinct institutional structures, affecting their efficiency and the viability of reforming them. These differences imply that the same policy reform may yield very different results in different countries, ranging from the good to the bad to the ugly. We therefore formulated a reform strategy that took country differences into account without abandoning the long-term goal of institutional liberal­ization in order to promote entrepreneurship, innovation and growth. The proposed strat­egy concerned reforms with respect to (i) the rule of law and the protection of property rights, (ii) the tax system, (iii) regulations governing savings, capital and finance, (iv) the organization of labor markets and social insurance systems, (v) regulation of goods and service markets, (vi) bankruptcy and insolvency regulation, (vii) R&D, commercialization and knowledge spillovers, (viii) human capital investments, and (ix) informal institutions. the necessity of tailored reform strategies taking into account this complementarity. development patterns of financial institutions today. Entrepreneurship has been documented to be an important part of economic systems’ efficiency, and one of the main engines of economic growth. One of the critical aspects of entrepreneurial success is access to financial resources. 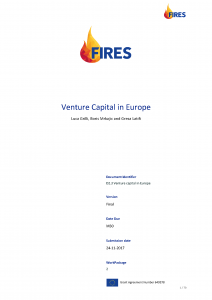 New innovative ventures, however, are often capital constrained as they by definition do not have a track record of past success (and hence reputation and credibility), neither they can offer tangible resources as collateral to traditional capital providers (e.g. banks). The barriers of information asymmetry and uncertainty perceived by debt providers has led to the establishment of specialized financial intermediaries called Venture Capital (VC) firms, more capable to overcome the hurdles and more prone to provide these inherently risky investments. Previous studies offered evidence that human capital obtained through education is a crucial explanation for cross-national differences in entrepreneurial activity. Recently, scholarly attention has focused on the importance of the choice of subjects such as Science, Technology, Engineering and Math (STEM) for the promotion of entrepreneurial activity. To our knowledge, empirical evidence on this link is scarce, despite the literature’s emphasis on the choice of study at the tertiary level. Given that difference in STEM education are particularly large between men and women, we utilized data for 19 European countries and the United States from the Global Entrepreneurship Monitor and studied the role of these differences at the country level for three stages of the entrepreneurial process: entrepreneurial awareness, the choice of the sector for entrepreneurial activity and entrepreneurial growth aspirations. We also tested whether the balance of the effects of gender differences in the education field is moderated by the nature of the institutional environment in which entrepreneurs operate. Our findings showed that individual-level explanations including education account for the gender differences in all three stages of early-stage entrepreneurial activity. Moreover, countries with greater gender equality in science education are characterized by higher entrepreneurial activity in knowledge-intensive sectors and high growth aspirations. Thus, next to individual-level education, closing the gender gap in science at the country level benefits the country as a whole by stimulating innovative entrepreneurial activity. associated with higher business ownership rates, except in the Anglo-Saxon model. that consider long-term diversity in the institutional labor market structure. 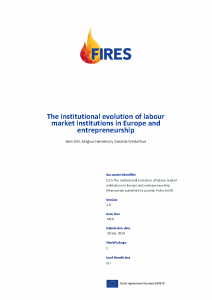 In line with the stated objectives of the FIRES project, this report aimed to bridge the gap between history and the future by providing insights and considerations for connecting the more historical analyses under FIRES with its forward-looking institutional reform proposals to promote European entrepreneurship. 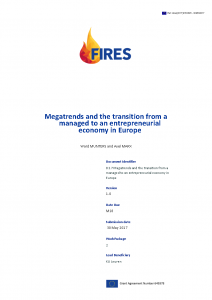 The specific aim was to identify, through a literature review of relevant studies, various ‘megatrends’ that drive the need for promoting an entrepreneurial society in Europe as well as the desirability thereof, now and into the future. Whereas the analysis of megatrends lacks a stringent theoretical framework or terminology, there appeared to be a consensus among reviewed literature attempting to identify these strands of global exogenous change: the impacts on society will be pervasive and significant – even if the nature of the latter’s concrete consequences may vary from ‘negative’ to ‘positive’, according to the qualitative analytical perspective taken by any respective study. Deliverable 3.1 “A Review Paper on Indicators and Growth Effects of Related Variety”, examined a number of studies that look at Frenken et al. (2007) study introducing the concept of related variety in regional economics. The review of related variety research showed that most of these studies find support for the initial hypothesis by Frenken et al. that related variety supports regional employment growth. The deliverable also reviewed studies that look at the process in which a region or countries develop comparative advantage in new industries (branching) based on the research by Hidalgo et al. (2007). The report’s review found that regions or countries that already host industries related to a specific industry are much more likely to become specialized in that industry. The report ends with a number of further research questions on i. methodology, ii. the role of unrelated variety in regional development, and iii. the need to analyze how related variety may spur innovation and entrepreneurship. This paper presents datasets on regional variables, in particular on related and unrelated variety on the one hand and opportunity-driven entrepreneurship on the other hand, for EU regions. We discussed the sources, nature and quality of the data, construction of variables as well as the descriptive statistics and spatial patterns. We ended with an outlook, discussing the future research questions that can be addressed empirically using this dataset. A number of studies have shown the positive effects of related variety among a region’s sectors on a region’s employment growth. However, the exact pathways through which spillovers between related sectors translate into new employment are left unanswered. Entrepreneurship may be a key vehicle through which business opportunities result from knowledge spillovers that lead to new jobs. By using pan-European survey data that distinguishes between opportunity- and necessity-driven entrepreneurs, we found that regional related variety positively affects regional opportunity-driven entrepreneurship, while no effect is found for necessity-driven entrepreneurship. These results held also after controlling for national institutions affecting entrepreneurship. reallocation across tasks is subject to frictions and that these frictions are countryspecific. non routine labor and specialize in goods that use non routine labor more intensively. behavioral norms in the workplace. This report has two related parts. Together they support the conclusion that a transition to a more Entrepreneurial Society will increase the overall adoption and implementation of corporate social responsibility (CSR) compliant behaviour in the economy. 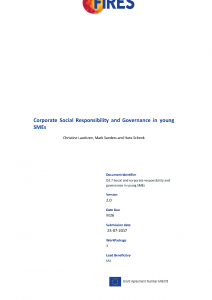 First, we provided an overview of the relevant literature, collecting the available evidence on the link between corporate governance and CSR-performance in young, small- and medium sized companies (SMEs). From this literature review we concluded the evidence is rather scanty and weak due to data problems. What we can learn from the literature, however, is that the personality of the leading manager is often instrumental in implementing CSR-compliant behaviour, more so in SMEs than in multinational (MNCs) and incorporated (ICs) corporations. The positive effect on CSR-compliance is thus conditional on entrepreneurs being socially oriented early on in the firm’s life. To investigate if that is indeed the case, we presented results of the Sharing and Cooperative Attitudes Lab Experiment (SCALE). We designed and implemented this experiment in Hamburg and Berlin in 2015-16. Our results will obviously have to be replicated in different settings to form a sounder basis for policy intervention, but the results across our three different subject pools showed that indeed entrepreneurs tend to be more cooperative and sharing than non-entrepreneurs and future professional managers. On the question: “How will the transition to a more Entrepreneurial Society affect the attitudes towards CSR?” we therefore tentatively concluded that the effect will be positive. This outcome is conditional on policies being put in place to ensure it is especially the creatively talented that (continue to self)select into entrepreneurship. Policy implications we discussed in some detail in the report can be found in the design of educational programs, entrepreneurial support programs, fiscal and subsidy programs for (young) SMEs and public procurement procedures. All these policy instruments should be carefully (re)designed such that the creative, not necessarily only the business savvy entrepreneurs will benefit. As creatives thrive in high trust environments with little external control and few high-powered incentives, this will clearly prove most challenging in low-trust societies. 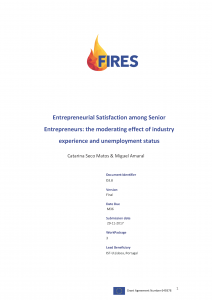 We theoretically developed and empirically investigated effects of senior entrepreneurs’ perceptions about monetary and non-monetary entrepreneurship-related outcomes and work history traits on overall business satisfaction. Building upon socioemotional selectivity theory we hypothesized and found evidence that senior entrepreneurs derive higher satisfaction from non-monetary rather than monetary entrepreneurship-related outcomes. Further, drawing on continuity theory, we found that senior entrepreneurs derive higher business satisfaction when possessing experience in the same industry (vis-à-vis no previous industry experience) and derive lower entrepreneurial satisfaction when facing a long (12 or more months) unemployment spell before starting their current business. These findings provided novel insights into the phenomenon of senior entrepreneurship and shed new light on the subjective assessment of senior entrepreneurship performance. Individuals are reservoirs of both skills and ideas and their location and mobility are keys to knowledge accumulation and diffusion. In advanced economies, innovation and technological knowledge have been both found to be strongly tied to the talented migrants. Thus far, only a scant few studies have studied the mobility of invetors and even fewer examined their impact on innovation performance. 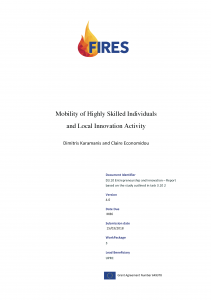 This task studied the drivers of highly skilled migrants across space as well as their impact on local innovation activity. We focused on patent inventors, a specific typology of skilled and innovative individuals who are deeply involved in the production of innovation and are important vehicle of knowledge circulation. Employing patent data to track their moves, we used a gravity model to examine whether geographic, technological and cultural proximities between countries and country level factors shape the flows of these talented individuals. As a comparison, in the same framework, we also analyzed the flows of non-inventor migrants. Our evidence showed that proximity matters for migration. Deliverable 4.1 “Report on Extension of the GEDI-indicator”, introduces the National Systems Entrepreneurship (NSE) as a framework for a resource allocation system driven by individual-level opportunity pursuit through the creation of new ventures and its outcomes regulated by country-specific institutional characteristics. The NSE approach is an important tool for policy makers to identify weaknesses in the entrepreneurial ecosystem. As entrepreneurial ecosystem services created through a myriad of localized interactions between ecosystem stakeholders, it is not easy to trace gaps in ecosystem performance back to specific, well-defined market failures that are addressed in top down modes. Earlier versions of NSE left out important topics such as Finance, Taxes, Labour Markets and Knowledge Institutions. This report addresses how to include taxes, labour markets and knowledge institutions in NSE. In this paper we look into the hypothesis that institutions drive high quality entrepreneurship that in turn promotes innovative and inclusive growth. We start our analysis by estimating baseline growth models for 25 EU countries over the period 2006-2014. We compare our results to those of growth model specifications in the tradition of Islam (1995) and Caselli et al. (1996) and then include various measures of entrepreneurial activity in these growth regressions. In addition, we control for, and interact with, institutional variables that we show to have a direct positive effect on our entrepreneurship variables. Regulation of credit, labour and business positively affects (high quality) entrepreneurship, while the size of the government is negatively linked to entrepreneurship. 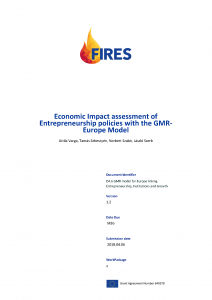 For these institutions, that have shown to promote entrepreneurship we apply a GMM panel data estimation method to account for endogeneity following the recommendations of Bjørnskov and Foss (2016). We find a positive link between entrepreneurship and GDP growth. These effects are reinforced after controlling for institutional characteristics that are linked to entrepreneurship in the existing body of literature. Our report thereby strengthens the empirical foundation under a more integrated and institutionalist approach to the study of entrepreneurship. 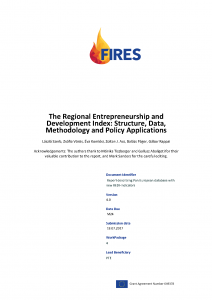 We discuss extensively how this report relates to the work on the Global Entrepreneurship Index in earlier FIRES-reports. In our conclusion, we discuss various possible explanations for our results and offer implications for institutional reform agendas aimed at stimulating entrepreneurship. In this technical report, we deliver a full description of the new Regional Entrepreneurship and Development Index (REDI) dataset, and of the calculation methodology. This report is an amended and renewed version of the previous REDI report (Szerb et al., 2014). After a general introduction of the index the report goes into the technical details of data collection and manipulation before presenting the index for 125 NUTS 1-2 regions in 24 EU member states. This paper seeks to put entrepreneurial ecosystems at the very centre of the processes of regional economic development. To do so, we develop the Regional Entrepreneurship and Development Index (REDI) to capture the quality of entrepreneurial ecosystems in European regions. This index captures the systemic nature of the context of entrepreneurship, and further develops the entrepreneurial ecosystem approach to economic development. We differentiate between different types of entrepreneurship, connecting these types to a distinction between overall (largely replicative), and Schumpeterian / innovative entrepreneurship. These types of entrepreneurship are both outputs of the entrepreneurial ecosystem and drivers of economic development. The entrepreneurial ecosystem provides the enabling context for entrepreneurship to take place, but entrepreneurs have to take actions in order to realize opportunities for new value creation. Overall entrepreneurship, proxied by the ratio of number of new entrants relative to the number of incumbent businesses, indicates the intensity of competition in a region. The Schumpeterian type of entrepreneurship, proxied by the ratio of innovativeness of entrants compared to that of incumbent firms, captures the process of creative destruction, and thus structural change of the economy….. According to the recently introduces smart specialization policy concept regional specialization must grow out of the regions’ own traditions instead of building on typically not replicable experiences of well-known successful regions. The main instruments of smart specialization are a particular combination of these elements characterized by entrepreneurial discoveries supported by the government. As a result the entrepreneurial focus of this approach is a crucial point. 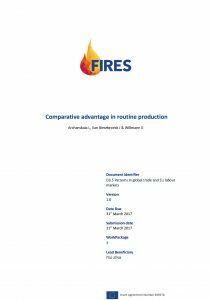 Published as: Held, L., Herrmann, A. M., & van Mossel, A. (2018). Team formation processes in new ventures. Small Business Economics, 1-24. We here describe the empirical approach taken to collect the “perfect timing (PT) database”, which traces the timing of labour-, finance-, and knowhow-related activities throughout the venture creation process on a monthly basis. The sample for this study was drawn from the Orbis database, which provides internationally comparable company profiles. A rigorous catalogue of selection criteria was developed and applied to arrive at a meaningful sample. To collect data in Germany, the US, the UK, and Italy, national call centers were contracted after a thorough tender process. While these call centers recruited venture founders for an interview, the actual interviews were conducted by an interviewer team of research assistants, based at Utrecht University (the Netherlands), Columbia University (NY, USA), the Universität zu Köln (Germany), and the Heinrich-Heine Universität Düsseldorf (Germany). These interviewers were selected and rigorously trained by the survey coordinators. These data collection efforts enabled the recruitment of 820 interviews and completion of 539 interviews within the FIRES project. Together with the already existing data of the preceding Marie Curie project, the PT dataset includes 1044 cases. Published as: Estrin, S., Gozman, D., & Khavul, S. (2018). The evolution and adoption of equity crowdfunding: entrepreneur and investor entry into a new market. Small Business Economics, 1-15. This case study offers an entrepreneurial and regulatory perspective on the potential of equity crowdfunding to address the entrepreneurial equity gap, within the context of the rapidly growing UK equity crowdfunding cluster particularly prominent in and around London. It addresses factors driving the growth of equity crowdfunding, including the regulatory and tax regime as well as the broader London entrepreneurial ecosystem, and provides for a comparison of the business models of the current three market leaders. In showing the importance of equity crowdfunding to investors, entrepreneurs, platforms, regulators and stakeholders in the wider national economy, it is argued that key contributory factors in the success of equity crowdfunding in the UK have been the London ecosystem for entrepreneurial finance and the emergence of a sympathetic tax and regulatory regime encouraged by policy makers keen to nurture innovation. Finally, the case study offers five main lessons for researchers and policy-makers to be taken from the London experience. This case study investigates the rise of solo self-employment in the Netherlands as well as the increasing importance of entrepreneurial activity by employees. The report attempts to explain which institutions have contributed to the deviating pattern in Dutch solo self-employment numbers from a European perspective, and argues that changes in formal institutions regarding the judicial and tax treatment of self-employed as compared to that of employees are the main determinant. It is argued that, mainly driven by globalisation and technological change, labour is increasingly organized in sets of tasks. It is concluded that policy should aim for developing and improving workers’ modern skills like creativity and innovation, rather than educating people for specific jobs, and workers should be made aware that they themselves are increasingly responsible for human capital investments during their own career. Finally, the current legal distinction should be loosened by providing all workers with equal access to the welfare system. In this report we provide an extensive overview of the nature, measurement, prevalence and causes of intrapreneurship at the country level. With adding intrapreneurship to the range of entrepreneurship indicators we arrive at a more adequate coverage entrepreneurial behavior in society than before, when only measures of independent entrepreneurship were taken into account. This, perhaps more adequate, measure of entrepreneurship might also solve another paradox: the Swedish entrepreneurship paradox. Even though Sweden, and other Nordic countries alike, lead global innovation and prosperity rankings, their independent entrepreneurship rates are relatively low. This report set out to explain why the Nordic countries, and Sweden in particular, rank very high with respect to entrepreneurial employee activity, i.e. intrapreneurship. This study suggests that intrapreneurship levels in a country are positively affected by levels of generalized trust, which increase job autonomy and welfare state arrangements for employees that ultimately enhances intrapreneurship and make self-employment a relatively less attractive occupational choice. These factors also largely explain the high levels of intrapreneurship in the Nordics and Sweden in particular. Innovative entrepreneurship is considered of key importance to ensure the dynamic efficiency of an economic system and to enable the achievement of great macroeconomic performances both in terms of productive growth and job creation. In this respect, it is becoming increasingly evident that it is not only the number of new startups that matters for that goal, but also their intrinsic quality is of dramatic relevance (e.g. Shane, 2009). 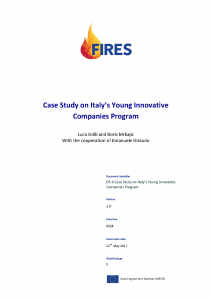 This report on the Italy’s Young Innovative Companies (YICs) Program implemented in November 2012 investigates whether a specific institutional change (the Law no. 221/2012) directed towards the sustainment of this specific typology of firms, i.e. independently created companies aged less than 6 years old with highly innovative potential, can facilitate the transition from quantity toward quality of entrepreneurship. More specifically, we build on the idea that institutional changes that reduce different types of barriers to entrepreneurship (i.e. entry and growth barriers, in particular) impact not only the rate of new company creation in an economic system, but also their entrepreneurial quality in terms of the skills and competencies of the individuals who become founders. Grounding on this perspective, we study how a reduction in different barriers impacts the human capital endowment of entrepreneurs, overall entrepreneurial performance, as well as their interaction – that is, if highly skilled founders can create higher quality ventures by leveraging the positive institutional change (both in terms of reduction of entry and growth barriers) that attracts them to become entrepreneurs in the first place. For this purpose, we exploit a quasi-natural experiment setting and analyze founders of 1,769 YICs founded before and after the Law no. 221/2012 reform, by breaking down the impact of lowering entry and growth barriers. In fact, the Law envisaged a wide bureaucratic and administrative simplification (typical barriers to entry), as well as some benefits as tax incentives, more flexible labor regulations (typical barriers to growth), lighter rules on insolvency and “fail fast“ procedure. By exploiting the retroactive nature of the mechanisms, we are able to discern what impact this policy reform had on the quality of created firms in terms of founders’ human capital and YICs’ sales performances. 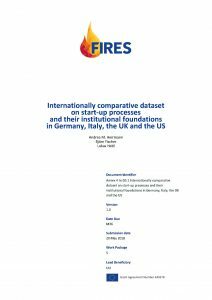 The empirical analysis is based on data collected through the means of a survey launched by the National Committee of the Italian Ministry for Economic Development on the “Monitoring and Evaluation of National policies for the Eco-system of Italian Innovative Start-ups” (of which one of the authors of this report is an academic member) and administered by the Italian National Institute of Statistics (ISTAT) in April and May 2016. The findings indicate: (a) that institutional change that reduces barriers to entrepreneurship increases propensity of high human capital individuals to become entrepreneurs; (b) that the instruments that reduce growth barriers in particular have a more significant impact than those directed to reduce entry barriers; and (c) that there is a super-additive effect of the reform and founders’ high human capital on the performance of the created firms. Furthermore, we discovered that founders endowed with more specific rather than generic human capital are more reactive in this respect. By documenting the importance that formal rules have in determining who becomes an entrepreneur, and by deepening our understanding on which are the most effective specific measures for selecting the most promising entrepreneurs, the findings of this report stress the key role that public policy, even in the short-run, may play in this domain. 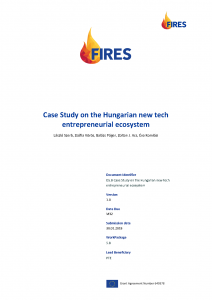 In this case study, we intend to depict and evaluate the state of the new tech entrepreneurial ecosystem in Hungary. As a descriptive case study, this paper does not directly formulate policy suggestions, but the information presented and discussed is highly relevant for policy makers. The comparisons between Hungary and other EU countries tell policy makers how Hungary is doing in terms of supporting new tech start-ups and which areas are in need of more, new or different types of policy making. New technology oriented firms, as a small subset of startups, are believed to be important drivers of economic growth and job creation via the facilitation of technological change and innovation (Audretsch 1995, Colombo and Grilli 2010). Indeed, the reforms to European Cohesion Policy have sought to place entrepreneurship center-stage via the introduction of the ‘smart specialization’ strategy (European Commission, 2012; McCann and Ortega-Argilés 2013, 2015, 2016). Entrepreneurship, and in particular its role on fostering innovation, is now seen as being key to the new EU smart growth and development agenda. 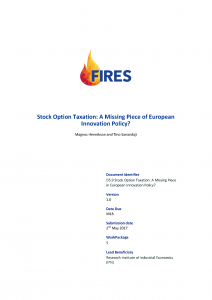 D5.9 Stock Option Taxation: A Missing Piece in European Innovation Policy? Venture capital has become a dominant form of innovation finance, used by many high-tech startups. Europe lags the U.S. in both VC activity and the creation of successful startups, and has recently been surpassed by China. Few European countries have rates of VC activity commensurable to their deep finan­cial markets, strong legal institutions and high R&D spending. This paper points to the tax treatment of employee stock options as an important and neglected explanation. Innovative entrepreneurship is a complex activity that normally requires support structures and collaboration by actors providing financial and human capital to startups. As a response to high uncertainty and transaction costs, VC financiers developed a model where founders and key recruitments are compensated with stock options under complex contracts. While most countries tax stock options as labor earnings, the U.S. allow them to be taxed at a low capital gains tax rate. This has led to near universal use of stock options in U.S. VC deals, while this remains less common in Europe. There is a strong correlation between favorable tax treatment of employee stock options and VC activity. We discuss the interaction between tax policy and contract theory to show why employee stock options are a suitable solution to agency and incentive problems in this sector. A major advantage of this tax policy is that it narrowly targets entrepreneurial startups without requiring broad tax cuts. Growing exports are a clear indication of economic success. There are many historical examples of successful nations and cities where welfare was based on international trading activities. Entrepreneurial inhabitants contributed to these success stories by establishing thriving businesses and expanding them through international networks. Local institutions supported these export activities by creating a business-friendly environment that stimulated growth and productivity among international traders. The same old story is relevant today. European welfare is strongly dependent on export successes in global markets. Firms are the key players in this export story. Therefore they offer the best perspective on how export successes can be achieved. This research aims to obtain a better understanding of firms’ export performance. Knowing the driving forces behind export success will support policy makers in the design of export enhancing policies. As increased exports are an important source of economic growth and welfare for the European Union, improving policies and institutions to stimulate exports in all EU member states as well as at the EU level is quintessential. In particular, this research report studies the evidence and determinants of Belgian firms’ exports. Belgian exports are an interesting case study given the strong integration of the Belgium in the European economy as well as the country’s openness to international trade. Our findings for Belgian manufacturing exporters are, however, relevant to all small open European economies. 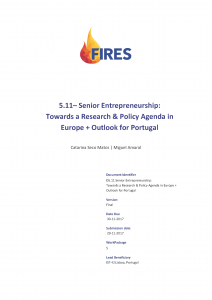 The present paper proposes and discusses a preliminary research and policy agenda on senior entrepreneurship in Europe, with focus on the Portuguese case. The analysis is organized into six key research questions, namely: (i) Why is Senior Entrepreneurship important? (ii) What is the current Knowledge & Academic Research available (and still lacking) on Senior Entrepreneurship? (iii) What are the key supporting initiatives available for Senior Entrepreneurs in the world? (iv) Are academics producing research on Senior Entrepreneurship with practical policy implications? (v) Are policies and supporting initiatives backed up by scientific knowledge? (vi) How can we produce and use adequate knowledge and policies towards Senior Entrepreneurship in Europe. In order to address the previous questions and to shed light on how institutions may better support senior entrepreneurship, we start by developing (a) a recent and comprehensive Systematic Review of Literature; (b) an analysis of international programs and initiatives for senior entrepreneurs based on secondary data. Additionally, we focus on the Portuguese case by providing (c) a thorough description of the national context drawing on primary data; (d) an analysis of senior entrepreneurs’ firm entry and growth dynamics by, using secondary data; (e) insight on senior entrepreneurs’ satisfaction, based on primary data, and a final discussion of Policymaking towards Senior entrepreneurship in Portugal. In order to discuss the interplay between Academic Research / Available knowledge and Policymaking / Supporting Initiatives, particular focus is put on Human capital, Social capital, Information and Communication, Funding and Research. The European Union aims to restore innovative, inclusive and sustainable economic growth to the Union and its Member States. To achieve that goal, it is imperative that the economies of the European Union become more entrepreneurial. To date the EU has launched many initiatives and formulated strategies to bring about the transition to an Entrepreneurial Society. Inspired by successes in the United States these strategies often involve deregulation, (financial) support for new ventures and entrepreneurship education. We argue, however, that such reforms only go skin deep. To really nurture an Entrepreneurial Society in Europe, a more fundamental reform agenda is needed. Here we propose reforms that relate to (i) the rule of law and the protection of property rights; (ii) the tax system; (iii) regulations governing savings, capital and finance; (iv) the organisation of labour markets and social insurance systems; (v) regulations governing goods and service markets; (vi) regulations governing firm failure; (vii) R&D, commercialisation and knowledge spillovers; (viii) human capital investments; and (ix) informal institutions. Overall, the proposed institutional changes move in a liberalising direction; however, one-size-fits-all policy reforms are not likely to be successful in Europe’s varied, historically deeply rooted and interacting institutional complexes. Instead, successful reform strategies must consider history and local conditions that affect the viability of reform without abandoning the long-term goal of institutional liberalisation to promote a more entrepreneurial society. This report on Italy illustrates the FIRES-approach to formulating a tailored institutional reform strategy to promote a more Entrepreneurial Society in Europe. 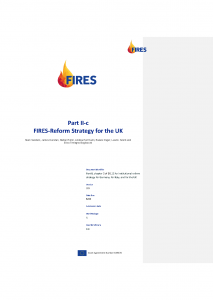 It is part of a deliverable that presents a menu of 64 reform proposals and illustrates how we propose one should systematically analyse the situation before selecting and proposing reforms. After carefully analysing Italy’s historically rooted institutional foundations, we triangulate historical, qualitative and quantitative information to identify Italy’s strengths and weaknesses. Based on this diagnosis we selected 14 proposals from the 64 presented in Part I to be most relevant for Italy. In Part I we have introduced 64 proposals for a more Entrepreneurial Society in Europe. Inevitably, however, these proposed reforms are general and motivated from a broad base of evidence and scientific debate. The resulting table thus gives us a menu of possibly useful interventions that would have to be implemented at different levels in the European Union. To support more entrepreneurial venturing in Europe, however, institutions need to be supportive of individual entrepreneurial ventures “on the ground”. 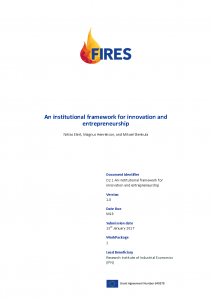 In the present study, we analyzed the legal implications of the FIRES agenda to reform the EU’s entrepreneurship policy, as laid out in FIRES Deliverable 2.1 – Institutional Reform for Enhanced Innovation and Entrepreneurship: An Agenda for Europe. 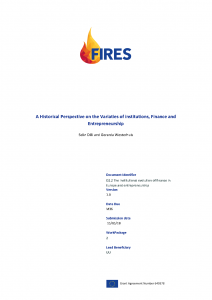 The aims of this study were threefold: (1) to determine whether the regulatory powers needed for implementing the recommendations made in Deliverable 2.1 lied at the EU level or at the national level of government; (2) to assess whether the recommendations were consistent with existing EU law and policy and whether there are any international conventions that would constrain their implementation; and (3) to determine if the recommendations should be addressed primarily to the EU institutions or primarily to the Member States, or to both levels of government equally….. 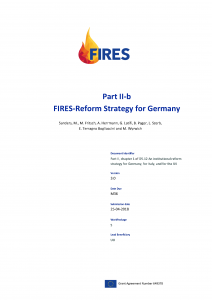 In this study, we primarily sought to gauge the views of a range of relevant stakeholders on the FIRES reform strategies for Italy,2 Germany3 and the UK,4 in particular, but also on the more general reform agendas laid out in FIRES Deliverable 2.15. More specifically, we aimed at gauging the views of the stakeholders on the merits of the proposals, the general usefulness of the three reform strategies, which of the proposals were the most important and which were the least important, and whether any of the proposals raised concerns regarding their political feasibility. Regarding the political feasibility of implementing the reform strategies for Italy, UK and Germany, respectively, the consulted stakeholders raised concerns with respect to nine proposals (out of a total of 47 proposals): five of which concern Italy (‘the rule of law’; ’knowledge generation’; ’education in the entrepreneurial society’; ‘employment protection legislation #1’; and ‘universities’), whereas the other four concern Germany (‘‘employment protection legislation #1’; ’social insurance systems #2’; ’knowledge diffusion and commercialization’; and ‘taxation of private wealth’). No concerns were raised with regard to the political feasibility of the proposals for Italy.